A group of students from Ellsworth High School, standing in front of the Cathedral of Notre-Dame in Paris on Saturday, April 13. On Monday, April 15, a massive fire broke out in the cathedral. Mainers who witnessed the enormous fire that engulfed the Cathedral of Notre Dame in Paris on Monday described the experience as harrowing and surreal. Ellsworth High School sent a group of 13 students, alongside five chaperones, to Paris this week on a trip to study the artists of France and Spain. The group arrived in the city on Saturday, and one of the first places the students visited was the cathedral. 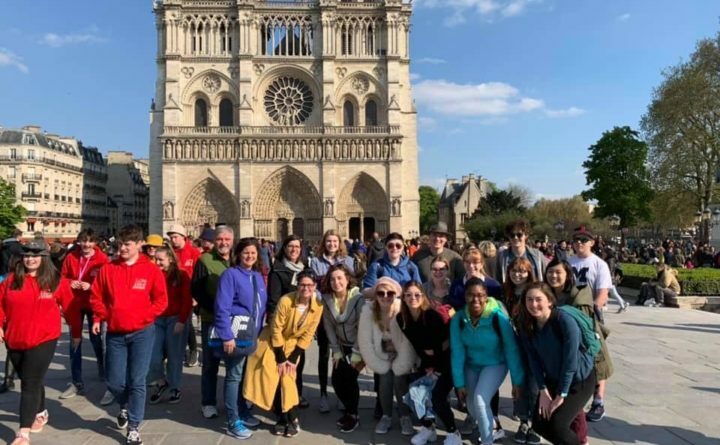 Jasmine Ireland, drama teacher at Ellsworth High, said the group had planned to take a tour of the cathedral Tuesday before leaving Paris to spend a few days in the Provence region of France. Ireland said the group was on its way to the Eiffel Tower at around 6 p.m. Paris time Monday, but had to turn around and return to the hotel after receiving the notification about the fire. 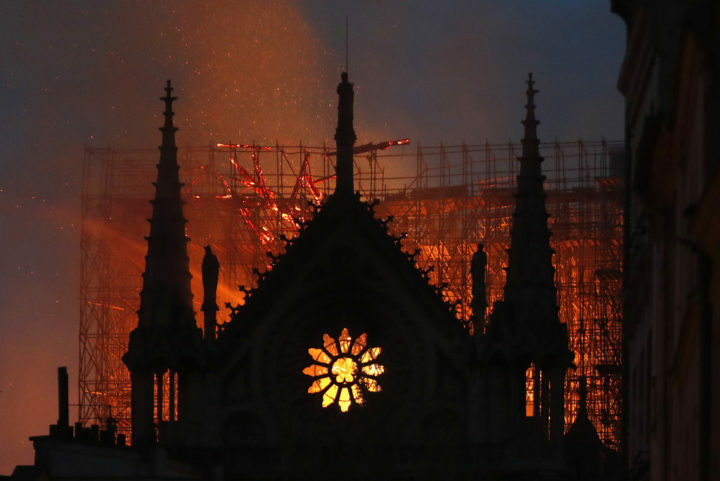 Bishop Robert Deeley of the Roman Catholic Diocese of Portland issued a statement about the fire Monday afternoon, asking for prayers for the people of Paris and for the firefighters battling the blaze, and lamenting the loss of an international symbol of Christianity. A number of high schools have sent students to Paris and other cities around the world this week, which is spring vacation. One of those schools is Waynflete, a high school in Portland, where Dora Anne Mills’ 16-year-old daughter, Julia, is a student. Mills, senior vice president of community health at MaineHealth and a former director of the Maine Center for Disease Control and Prevention, said her daughter and her classmates arrived in Paris on Monday morning and visited Notre Dame just two hours prior to the fire breaking out. The group had decided to forgo the tour of the inside of the cathedral — which would likely have occurred at around the same time as the fire. Mills said she and her sister, Gov. Janet Mills, had spent the weekend talking with her daughter about Paris, where Janet Mills lived for a year in the 1970s. Correction: An earlier version of this story incorrectly stated which school Julia Mills attends. She goes to Waynflete, a high school in Portland.